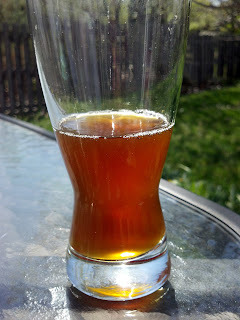 I am not sure how it will turn out, but the hops steeping in the warm wort sure smelled good. 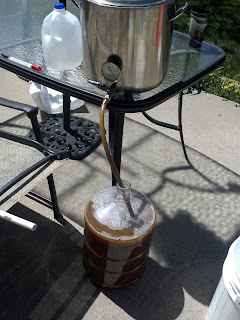 I also took out the 30 minute hop addition from last time and added more hops in at 10 minutes. This should boost the hop flavor as well. The boil went smoothly. 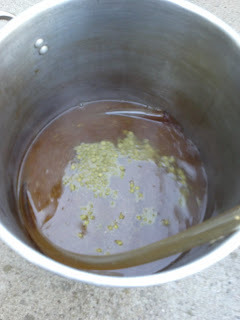 Actually, it was sort of relaxing to not have to worry about doing anything between the start of the boil until I added Irish moss at 15 minutes and then hops and yeast nutrient at 10 minutes. It still is not too hot here in Denver so the chilling went well. I pitched right at 64 or 65 just as I always want to do. I diluted with about 1/4 gallon of water and ended up with a 1.062 OG, which is 2 higher than planned, but certainly not anything to worry about. I keep telling myself I need to increase my evaporation rate for my calculations, but I have not taken the time to do it. Not a big deal. My gravity sample. Pretty, isn't it? Fermentation took off vigorously, with the temperature in the low to mid 60's on the first couple days. Last time, I split the 5 gallon batch into two Mr. Beer fermentors. I dry-hopped one batch and not the other to see which I preferred. I preferred the dry-hopped version, so I will be adding an ounce of Cascade and half and ounce of Amarillo either today or tomorrow. I'll leave those in for about a week and then keg the beer up after that. I am looking forward to having this beer ready to drink. Unfortunately, the BlackHawks lost to stupid Mike Smith and the stupid Phoenix Coyotes, so I will not be able to drink any of this batch while watching them in the Stanley Cup Finals. Bummer. But, I will enjoy the beer none-the-less.